I had the wonderful opportunity, recently, to visit Portland for the premiere of my talented niece (a dancer/choreographer)’s program of new works. 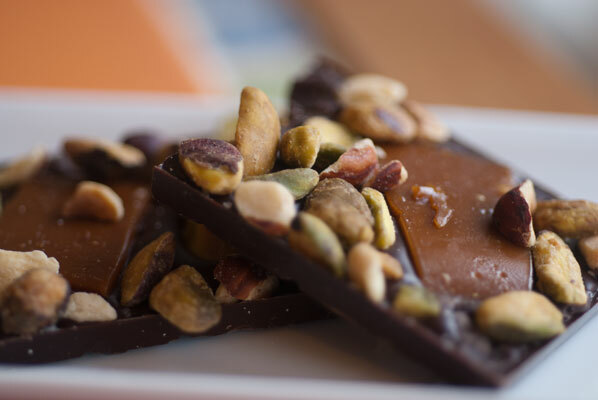 It was one of those “slightly less than 24 hour” visits, but I was determined to get to a boutique chocolatier I had read about: Sarah Hart’s Alma Chocolate, on NE 28th Avenue, in the Northeast Portland, Kerns district. I love Portland because it is home to all kinds of wonderful, unique little spots. A walking and biking city, Portland celebrates a diversity of interests – in fact one of its slogans is “Keep Portland Weird”, in other words, unique. From Powell’s World of Books to Voodoo Donuts, to the hit comedy series Portlandia, to my brother-in-law’s streetcar line, Portland is a friendly, funky, kinda cool, smallish, bigger west coast city. 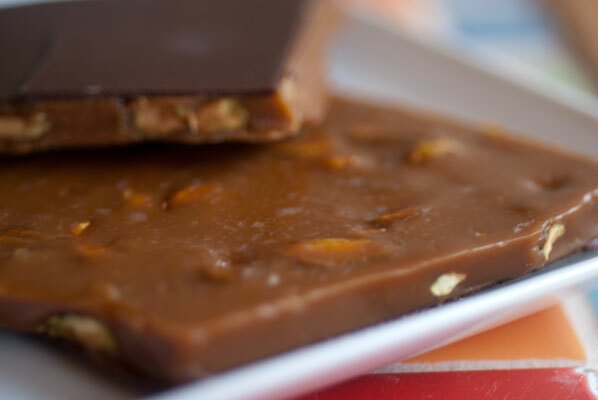 And Alma Chocolate fits right in to this eclectic, progressive mix. My sister and I arrive at Alma straight from the airport, promptly as the doors are opening for business. In fact, in my usual clumsy eagerness, I manage to get in the way of the very patient Ruth, who is also the pastry chef, while she tries to get the sandwich board open and out the door. Upon entering the shop, I am struck by the sconce in the wall to my right. This is home to what appear to be religious relics, and upon closer inspection are molded chocolate, gilded with 23 karat edible gold leaf. With a collection varying from Mary of Guadalupe to a Celtic fertility goddess to my absolute favorite: the Hamsa Hand (Hand of Fatima), the chocolate icons are among Sarah’s signature pieces. 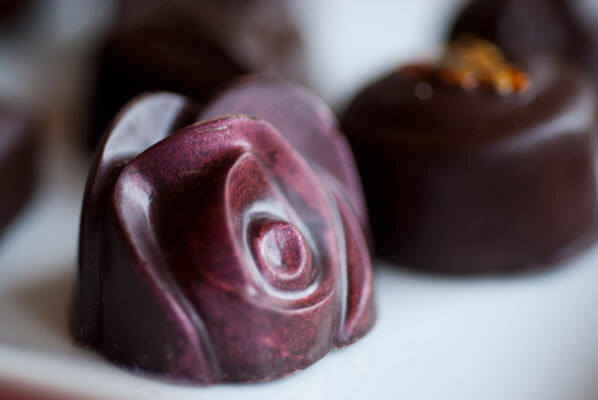 Sarah is all about collaboration, and when she decided to make the chocolate icons, was able to call on her friend, an artist and mold maker, who helped her custom-make these molds. When the chocolate comes out of the mold, she hand applies the gold leaf to each icon. With their rough burnished beauty, it is no wonder people sometimes would rather keep them than eat them. 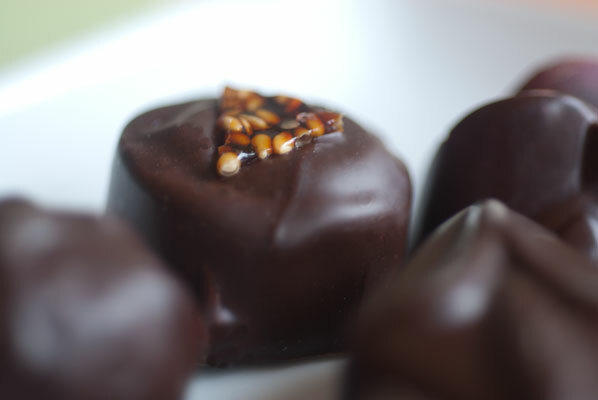 But I can assure you, they are a very tasty 70% dark chocolate, (also available in milk or white, upon inquiry). And the gallery feel is accentuated by some wonderful, whimsical pieces of Sayuri Sasaki Hemann’s. Sarah tells me that, a year ago, Sayuri decorated the shop with a wall-sized aquarium of sculptured jellyfish and marine life. I will have to return when she has her next show at Alma. The collaborative feel continues into the corner, as Sarah points out a gigantic cocoa pod tree lamp, crafted by another artist friend. I love this marriage of fabric, wood, clay, paint and food art. And I am very happy we are the first customers of the day, as this allows us our pick of the chocolates on offer, in the display case. I know I am going to have to get “doubles” of a few of these. While my sister and I pore over the bonbons, Sarah generously stuffs a bag full of Alma’s made-in-store chocolate toffees and barks. Since I will be stepping directly into teaching a class after I get off the plane tomorrow, my students will be thrilled to sample these, but of course, I will need to before they do. 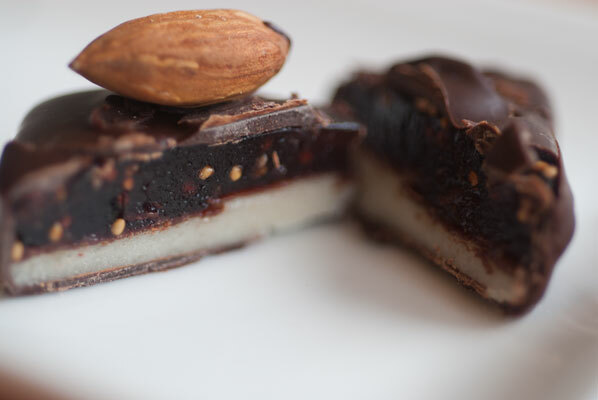 Along with the chocolates, Alma’s tiny cafe provides some wickedly thick and sumptuous drinking chocolate, coffee and a rotating selection of in-house made bakery goodies, including brownies, cookies and Ruth’s mom’s chocolate cake. We have to dash off, and unfortunately haven’t time to stop for a coffee, so we bid Sarah and Ruth good-bye, my arms loaded with bonbons and barks, and I take one last look around at this wonderful little gem of an innovative neighbourhood shop. Ruth puts two Walnut Chunkers in another bag, for our ride home, although these were inhaled by me as we crossed the street (they don’t serve breakfast on the plane anymore), so they didn’t actually have time to leave crumbs on my sister’s car mat. 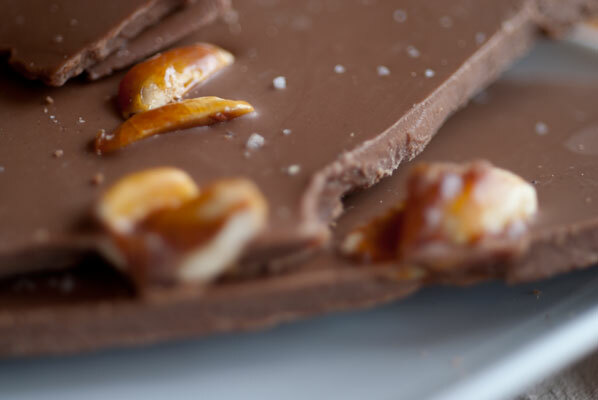 The Chunkers sport nice big pieces of crunchy walnut, in a flourless chocolate dough – mmm, the perfect “slightly after breakfast treat”. I justify this easily, as I need the energy for this busy day. – Oh, oh, oh! I have a big “YUM!” next to this one, in my notes. A lovely figgy hit is followed by a delicious delicate almond marzipan flavor, then more figgy finish. This was both my sister’s and my favorite. – Whoo! 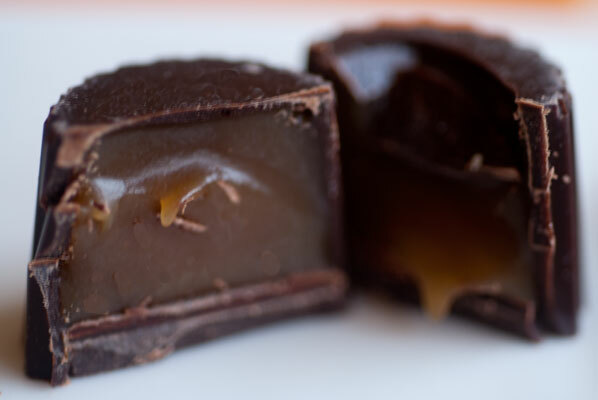 This whiskey caramel centre has a good, flavourful whiskey kick (and I don’t normally like whiskey), which blends well with the sweet caramel – and opens up the nasal passages. 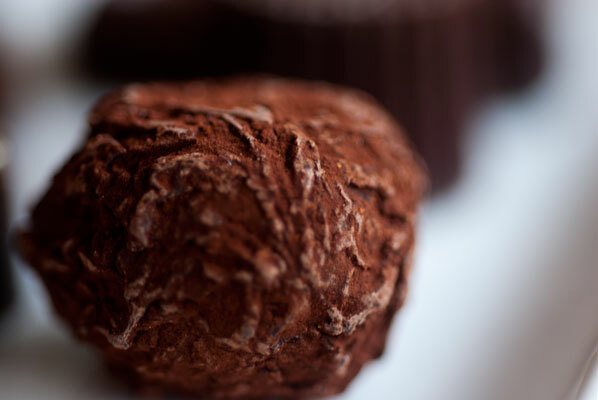 – made with chile de arbol and cinnamon, this truffle has a good kick of spiciness, which marries with the smooth dark chocolate. – I like that I can see everything I am eating!